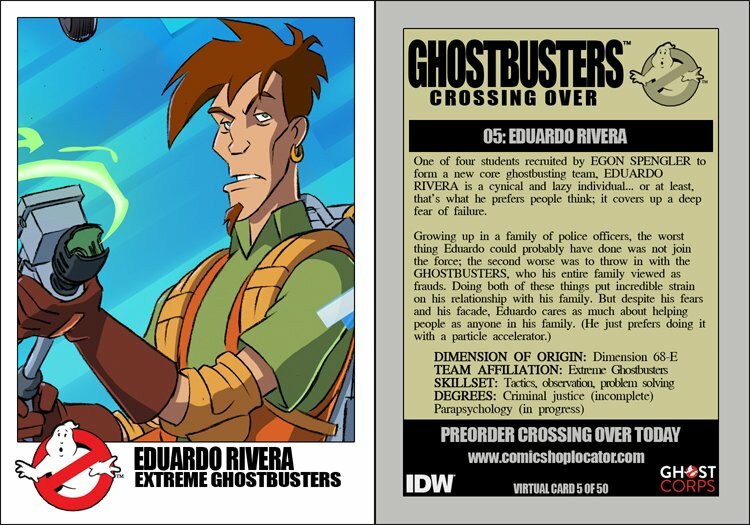 One of four students recuirted by EGON SPENGLER to form a new core ghostbusting team, EDUARDO RIVERA is a cynical and lazy individual... or at least, that's what he prefers people to think; it covers up a deep fear of failure. Growing up in a family of police officers, the worst thing Eduardo could probably have done was not join the force; the second worse was to throw in with the GHOSTBUSTERS, who his entire family viewed as frauds. Doing both of these things put incredible strain on his relationship with his family. But despite his fears and his facade, Eduardo cares as much about helping people as anyone in his family. (He just prefers doing it with a particle accelerator).